The newest song by Miranda Lambert, called The House That Built Me, has me thinking. 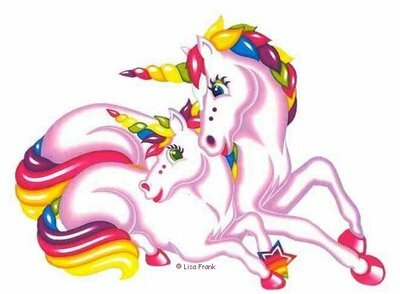 When I was a tween I had a bedroom decorated in rainbows and unicorns....it was pure awesomeness! The wallpaper was checkered in a tic tac toe rainbow pattern, the velour blinds were green, and I had a rainbow comforter with cool fabric wall hangings to tie it all together. To make things even more awesome, I had a blue chair from Function Junction that folded out into twin bed for sleepovers. My dresser was actual rolling crates that came in three different colors (white, yellow and red). I loved that room, and wrote a secret message on the wall of my closet that was not visible unless you crawled deep into the back (and I wonder if it is still there, since the house is still standing). I wish I had photos of it to share. I spent a lot of time daydreaming in that room. I have found a few images that I once loved to help me get in touch of that fearless little kid I once was, that believed dreams were for conquering. One of my favorite movies of the 80's was Legend. This was way before Tom Cruise became a one man circus act. Honestly, he maniacal laugh gives me goosebumps, but he was once a heartthrob. My friend had his All the Right Moves poster on her wall and we swooned over it. I wanted to be Mia Sara and touch the unicorn. I just added this movie to my Netflix. Got to love that unicorn. No kidding!